If you suffer from irritated skin, or if you’ve ever been affected by irritated skin in the past, you’ll know just how frustrating and uncomfortable the condition can be. The skin is actually the largest organ in the human body, and yes, as odd as that sounds, the skin is classed as an organ. Irritation to the skin can be caused by a wide range of conditions, though it is skin asthma which is particularly nasty. For that very reason, in today’s article, we are going to be covering skin asthma. Below you will find detailed info on what skin asthma is, what causes it, what the main symptoms are, before finishing off by taking a look at treating the condition and looking at a few simple home remedies. So, without any further delay, let’s learn more about skin asthma! Cetaphil For Skin Asthma: How Beneficial It Is? If you’ve never heard of skin asthma before, there’s a good chance that you will have heard of it when it is being referred to by its other name – eczema. Medically speaking, skin asthma is known as ‘atopic dermatitis’ though for the purpose of today’s article, we’ll refer to it as eczema, or skin asthma, to try to keep things simple. This condition is not overly dangerous, though it can cause a lot of physical and mental pain and can make life pretty uncomfortable for those affected. Skin asthma is genetic, it is a chronic condition, and it is not contagious, so you needn’t worry about spreading the condition if it affects you, nor should you worry about catching it if you come into contact by somebody with eczema. It is medically known as ‘atopic dermatitis’ because ‘atopic’ means that something is predisposed to be more sensitive to allergens (just like asthma), and dermatitis is chronic inflammation of the skin. Is Skin Asthma And Eczema The Same? From the above discussion “skin asthma” and “eczema” may seem to be same for many of you. However there are few differences between them which makes both these medical conditions different. While eczema refers to itchy skin inflammation, there is no (or very less itchiness) experienced in skin asthma. Generally the condition starts with showing the early signs of eczema which gets worse and chronic, for allergic patients, to cause the problem specifically known as skin asthma. Who Is Affected Most And Are At Risk? Studies show that babies with family history of asthma, hay fever, eczema, atopic dermatitis, etc are at higher risk of getting skin asthma. The condition is more likely to affect children than adults, as 1 in 5 infants will suffer from the condition. It is still prevalent in adults however, as 1 in 50 adults will be affected by skin asthma. Furthermore, females are also more likely to be affected than males. The condition is often brought on due to hyper-sensitivity of the person’s immune system, when the individual comes into contact with irritants and allergens. Though the most commonly affected parts of the anatomy are the face and limbs, any part of the anatomy can be affected. As we touched upon previously, skin asthma is primarily a genetic disorder which is caused by what is known as the ‘inherited barrier defect’. This is a condition in which the protective barrier surrounding the skin, becomes ‘leaky’, which in turn results in it drying out and becoming more prone to irritation by outside environmental factors and allergens. This imperfection of the protective barrier is caused by a genetic mutation which means that the skin is more permeable. This means that more moisture from the skin becomes lost, and as you can possibly guess, one of the first things that happens here is that the skin starts to dry out. This then causes the PH of the skin to drop sharply, which creates a much more acidic environment. This results in degradation of proteins and lipids (fats) in the skin, and so they begin to breakdown. That’s not all however, as the inflammation in the condition is brought on by an increase in the amount of Cytokine produced. Cytokine is a chemical messenger, and too much can result in an increase in fluid loss, plus it can make it much easier for irritants and allergens to penetrate the skin. Processed foods – Processed foods are no good for the body, whether you suffer from skin asthma or not. They are packed full of artificial chemicals, flavourings, additives, and preservatives, which can trigger a number of allergic reactions in the body – resulting in a skin asthma breakout. Eggs and dairy – Studies have found that diary produce, and eggs, have also been heavily linked to skin asthma, so it is best that you cut way back on your intakes of these foods, or ideally, you should cut them out of your diet entirely. Simple sugars – Foods and drinks rich in simple sugars, I.E Candy, sugary soda, desserts, fruit juice, white bread etc, should also be avoided as they can cause a sudden spike in insulin levels. When this happens, inflammation can once again occur, resulting in a skin asthma breakout. So, we’ve looked at what skin asthma is, and we’ve also looked at the symptoms, causes and triggers to be wary of. For this next section however, we are going to become a lot more pro-active, and we are now going to look at a few effective skin asthma treatments and natural home remedies that work wonders for dealing with the condition. 1- Consume anti-inflammatory foods – As we’ve mentioned many times above, inflammation is one of the most common causes and triggers of skin asthma, but the good news is that it can be avoided. One of the most effective ways of treating and preventing skin asthma is to consume foods renowned for their anti-inflammatory properties. Oily fish for example, is rich in omega-3 fatty acids. These fatty acids provide numerous health benefits for the body, though they are particularly effective when it comes to inflammation, as they possess potent anti-inflammatory properties. Other great foods include: turmeric, red meat, and fish, which all contain B vitamins and minerals such as zinc and iron. 2- Moisturize the skin daily – Another fantastic way of treating skin asthma, and helping to prevent it completely for that matter, is to moisturize the skin daily. You can purchase moisturizing creams and lotions, but many of these products may contain ingredients which could make matters worse. If you’re looking for a completely natural way of moisturizing the skin, you can purchase specially-created organic moisturizers, which contain nothing artificial. Alternatively, virgin coconut oil works very well, with the added bonus of also making your skin smell amazing in the process. Ideally you should moisturize the skin early in the morning, and last thing at night before going to bed. 3- Use an aqueous cream – Another effective way of managing your skin asthma is to apply an aqueous cream to parts of the body that are affected by the condition. If you remember, one of the primary causes of skin asthma was a faulty skin barrier, which meant that moisture could escape and leave the skin dry and cracked. An aqueous cream however, is designed to act as a replacement skin barrier. Not only does it moisturize the skin, it also leaves a very thin layer of oil over the skin’s surface, which helps to seal in moisture and prevents evaporation. 4- Don’t bathe excessively – Bathing daily is an important part of everyday life and is essential for good hygiene. However, if you bathe more than once per day, or if you spend prolonged periods of time in water, you may wish to rectify this pretty-quickly. You see, in one of life’s many ironic twists, the more time you spend in water, the dryer your skin becomes. That’s right, frequent bathing results in dry skin, which can bring on skin asthma, or can exasperate the condition. Try to limit your amount of time in the water to no more than 20 minutes per day. 5- Use anti-itch lotions – Because skin asthma is such a common problem, there are now a wide range of products out there which are designed to help people manage the condition more effectively. One of the best things you can do if you are affected, is to purchase a natural anti-itch lotion. From the name, you can probably guess what this lotion does. If the itching is driving you mad, or if you just want to nip the problem in the bud nice and early, an anti-itch lotion is perfect. Cetaphil products have been used since decades for treating baby eczema and very dry skin problems in adults as well as children & infants. Most of these Cetaphil products are designed keeping in mind the gentle skin of babies and are therefore strong enough to clean but gentle enough not to further irritate their sensitive skin. 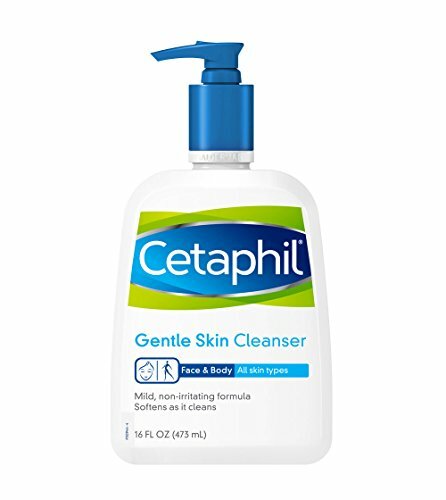 Cetaphil® body wash, cleanser and moisturizers comes with patented Filaggrin technology™ and ceramide technology to combat the symptoms associated with skin asthma and eczema on face. The best thing about these products is it’s clinically proven for infants (aging three months and older) and are suited for total-body use including face. If you or your baby is suffering from skin asthma or eczema condition, you can use these products safely at home for getting the best natural treatment. What Is Omega-3 And How It Benefits Asthma And Allergy?